When a family or individual borrows money from the bank to finance a home, be it a traditional mortgage or home line of credit, they are going into significant debt for their home ownership. It would be nice if we could all save up the $300,000 to $500,000 to buy a home in Canada, but that would take too long. We Canadians want it all right now – the big house, nice cars, all our electronic toys, etc. This has led to a culture of debt – we borrow to have the things we want today. When borrowing money, we’ve all heard the term good debt and bad debt. This basically means that the purpose of our borrowing will either create value or create additional cost. For instance, if you borrow money to buy a car, and that car allows you to accept a higher paying job further away from home because you can now commute to work, this is good debt. If you borrow money to buy a very expensive sports car or big truck which has no practical purpose (just for fun or show) this is bad debt, because the interest on the loan has no real purpose. It just adds cost. Generally home buying and mortgages are good debt. So long as you can afford the mortgage payments now and in the long-term, a home not only retains its value, it increases its value over time. The interest you are paying on the mortgage can be very costly, but you are also paying off the principle in the home, and building value. Considering that you would need a place to live anyway, you have three choices: 1) Rent; 2) Buy with a Mortgage; 3) Buy with all Cash Down. Since most people can’t afford to buy a house for cash, they really have only two choices. Renting is a pure cost and brings no long-term value. It only provides the home and shelter you need. A mortgage gives you the home and shelter PLUS builds value, in exchange for paying an interest rate on the money loaned to buy the house. Are you Insuring your Mortgage? The bank controls the policy and will cancel coverage if you leave them for another lender. The bank is the 100% beneficiary of the policy – your family gets $0 cash. It’s the bank’s risk that needs to be insured – they lent you the money. The policy is a declining benefit with a constant premium – as you pay off your mortgage you have less and less life insurance but your payments remain the same. You’re paying the premium for the bank’s life insurance plan! The cost of term life insurance is usually cheaper than the bank’s premium rates. You can cover off more than just your mortgage – you can protect your family’s lifestyle too. You can lock in premiums for a long time, like 20 or 30 years or even for life. 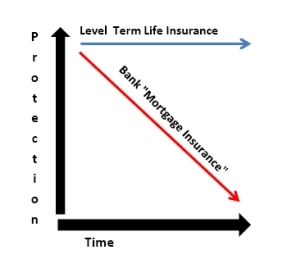 The life insurance benefit does not decrease as you pay off your mortgage. Your family receives 100% of the death benefit as a tax free cash payout, which gives them options. You can take your personal life insurance with you where-ever you go, even if you leave Canada. You can choose to have a policy that is similar to buying a home, with a cash value and eventual ownership of the full life insurance benefit. Are you insuring a debt or protecting your family’s lifestyle? The question to me is what are you protecting? If you’re only focused on a debt, and making sure the debt is paid off, then I guess you can stick with the bank’s mortgage life insurance policy. It might be a little more expensive than personal life insurance, but it is convenient to buy. But, if your home represents more than just a debt; if it represents your family’s life, a place of love, a place to build a future and fulfill your dreams, then you are protecting far more than the bank’s debt. You should be focused on protecting the future hopes, dreams and lifestyle that your family has, and that requires proper life insurance planning with a qualified and licensed life insurance professional. If you would like to discuss your family’s life insurance needs, and compare personal life insurance to the bank’s mortgage life insurance policy, please contact us today. We would be happy to provide you with a free, no obligation quote and financial needs assessment to make sure your family is properly insured.